The Aboriginal Tent Embassy is legendary. Located beside the Old Parliament House in Canberra, the Embassy was established in 1972 in order to demand sovereignty for Australia’s Indigenous peoples. Over the years, the Embassy has become an important symbol for Indigenous Peoples throughout the world. The Embassy speaks to the relationship between differing civilizations, the obligations of modern state governments and the vital efforts of Indigenous Nations to maintain their cultures, defend their lands, enact their rights and preserve life. And the Embassy is far from alone. In fact, right now, there are a total of seven Embassies dotted around the Australian coast; several of which have emerged in the past few months. And there will only be more. Our Indigenous Brothers and Sisters in Australia are coming forward in a big way to challenge the arrogant assumption of governments and restore health and sanity to the land of fire. However, this growing movement needs your support. As friends and allies are constantly pointing out to Intercontinental Cry, many of the embassies are being hammered by the government. 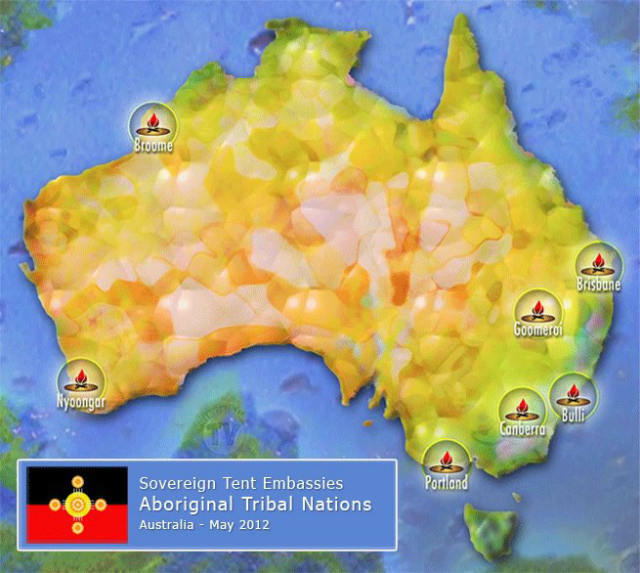 The Nyoongar Tent Embassy, meanwhile, has faced repeated invasions/evictions. With tensions clearly on the rise, there’s no doubt this state-sponsored violence will continue. And if the movement remains hidden from the international community, that violence will only get worse.